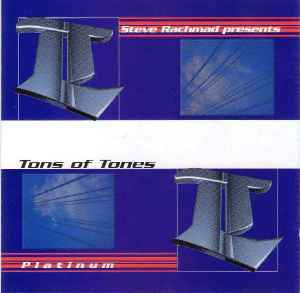 I might get more flame throwers than I had hoped for pointed in my direction for saying it, but for the money you will be paying for Tons Of Tones' (AKA Steve Rachmad) album "Platinum", you better re-think twice, 'cause in my humble book of grades, this one's hype is hardly justified. Keep in mind that none of it is strikingly lackluster, but many listeners tend to make the mistake of identifying rare with good, which is hardly the case here. While this is quality tech house through and through, apart from Sheherezade, with its heart melting and touching chords, I don't think I've ever felt the urge or the need to play any track here. Well, add Sisteron to Sheherezade as well, as it has really captivating melody work. As for the rest, sure it is good, but it lacks that extra touch which would make me want to reach deep into my wallet in order to get this. Most track move at the speed of around 135bpm, with soothing melodies and occasional vocals. Very Detroit-ish, alla Carl Craig, but Rachmad's synth and melody work is, in my humble opinion, far from being that impressive. While he is obviously heavily influenced by the likes of Derrick May, Craig, Kenny Larkin and The Black Dog, Rachmad delivers quality material, no doubt about that, but question marks are raised when I see the price tag here. All of the respective artists I have just mentioned have recorded material which is, to say the least, just as good as this, but costs half of what this'll cost you. So, my sincere recommendation would be, if you are after smooth and soulful Detroit influenced techno, there is plenty of that to be found around for far more accessible prices. Try out with Carl Craig's "The album formerly known as..." or Larkin's "The metaphor", or if you are after stuff which is more recent, and has a great melodic touch, Petar Dundov's "Escapements", although that is slightly different than what is presented here. However, unless you really are a die hard fan of Steve Rachmad, I find it rather thoughtless of any potential buyer to venture into spending plently of cash for this one before knowing beforehand what is it that he will be giving his hard earned cash up for. Happy hunting!